I am honored today to feature a guest post from the writers for the Children’s Hospital & Medical Center in Omaha’s website: small beats. Their articles are always inspiring, empowering and supportive of caregivers. They wrote this article exclusively for my blog, which I am thrilled to share with you. When your child has a serious health condition, playing the roles of both mom and caregiver is often overwhelming. Giving in and giving up on any sense of normalcy is a real possibility for a lot of moms with heart kids. But it doesn’t have to become your reality. If you’re fortunate enough to have friends and family members ready to help, their support is your key to preventing burnout and depression. What kind of support should you look for? Manager, director, supervisor—no matter what you call this person, she is the one who helps you take a step back so you can see the big picture of your child’s treatment. She is ready and willing to go to your child’s various appointments with you, if necessary. She can act as a second pair of eyes and ears at these appointments, helping make sure every issue gets addressed and every question gets answered. She also is a source of comfort if the doctor has to give bad news. This person should be someone very close to you and very trustworthy because she’ll be front row for the intimate details of your and your child’s experience. This person keeps track of your child’s medical tests and procedures: What was done? When was it done? What were the results? You won’t want to scramble to find this information if there’s an emergency or if your child suddenly needs to change medical teams. She’s the type of person who’ll show up at your house with an elaborate medication organizer to help you track your child’s medications and dosages. Ideally, this person can run to the pharmacy for you as needed to make sure you’re always well-stocked. Your record keeper also organizes more than just medical documents. She can help with organizing your mail, transportation to doctors appointments and childcare for your other kids. Exhaustion is a common aspect of caring for a child with a health condition, especially during and after long hospital stays. So, when you have a few free moments, it’s okay to not have the energy to return all the waiting voicemails and email messages. This is where your social networker can help. She can respond to loved ones’ inquiries about how your kid is doing. This person can also reach out to your employer just in case an emergency happens and you don’t have time to call and explain the details. If you have a church community supporting you, she can give them updates when you’re not able to attend. The demands of caregiving can make tasks like laundry, dishes and cooking drop to the bottom of the list. They’re time consuming, energy draining, and you’ve got other things to do. Still, they have to be done. Maintaining a clean environment is important for anyone with an illness, especially if they have a compromised immune system, like our heart transplant kiddos. Tidying up is helpful for you too. A messy environment seems to make an already stressful situation seem more chaotic. But, a neat, clean home environment can add a tiny bit of peace. The de-clutterer can come over—even if it’s just once a week, or the day before you come home from a hospital stay—to fold that pile of laundry that’s been on the couch all week, to tackle that mound of dishes, or to bring a meal that’s large enough for leftovers. 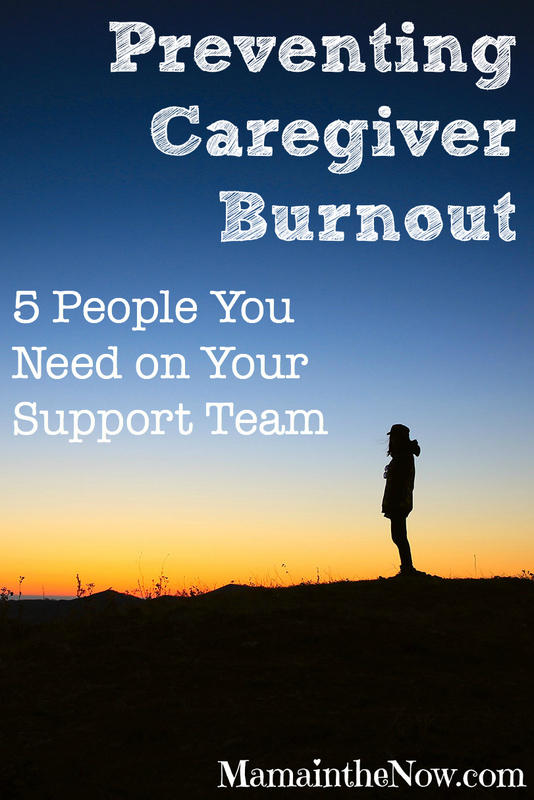 Most caregivers forget that they have to care for themselves too. Even with everything that’s going on, you still need to get enough sleep, get some kind of physical exercise and take a break every now and then. The distractor encourages you to take time away from your day-to-day caregiving routine—even if only a couple of hours. She might come over to spend time with your kids while you take a much-needed nap. She can also babysit for the evening so you can go on a date night with your husband. She knows you may not be able to leave for long periods, but when you happen to have a few moments free, she calls you to go for a 30 min walk at the track or to get pedicures. It’s hard to pull yourself away for self-care, so let her do it. Decide which of these roles would be most helpful for you, and ask the people you trust to put on one of these hats. Also, decide which of these roles you’d be good in, because one day another mom may need your help. Follow Children’s Hospital and Medical Center Omaha on Facebook and Twitter. I just wanted to say thank you for this post. I am a military spouse to two special needs kids. My son has autism, SPD, Apraxia of Speech, and a feeding disorder. My daughter has complicated medical needs including a feeding tube and apnea monitor and has been hospitalized 7 times. She is about to have surgery 2#. Sometimes finding the above people can be so hard. As a military spouse, we have no family here. Friends have moved on as most of them are military spouses too. Part of our family has been encouraging, but the other side refuses to help or believe anything is wrong with our kids. We get no support from them. I guess what I’m saying is that sometimes it’s hard to find all these people, and if you have all of them you are very lucky. I am sharing with Pinterest and Facebook. I appreciate the post, it’s very needed! THANK YOU, Kathryn for checking in! You have so much on your plate, girl! Stay strong mama! You sound like an incredible woman. Hello, I really enjoyed this post and it resonated with me as a social worker supporting families who are caring for a child with special needs. I put out a quarterly bulletin for the families who are accessing respite services and I would love to add this to copy this into the bulletin with your credits. Sorry I pressed enter before I could finish my question. Would you grant me permission to use this in our quaterly bulletin?